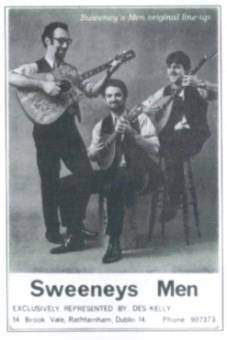 Was Sweeney’s Men a groundbreaking group, as some claim, or, in hindsight, just a band whose curiosity value lies in its introduction of the bouzouki to Irish music? Well, this double album collection offers plenty of opportunity to explore the possibilities. There were actually several versions of Sweeney’s Men. The first consisted of Joe Dolan, a guitarist from Galway (and not the MoR balladeer), together with Andy Irvine (mandolin, harmonica and guitar) and Johnny Moynihan on bouzouki and tin whistle with all three members singing. This original line-up recorded a single, Old Maid in the Garret/The Derby Ram which reached number six in the Irish charts in 1966, though signally failed to make any headway when released in the UK. Dolan left shortly afterwards and Paul Brady took his place for a couple of shows, though declined to leave The Johnstons to join Sweeney’s Men on a full-time basis. Instead, Irvine and Moynihan recruited Terry Woods, a 12-string guitar, banjo and (occasional) concertina player. This new version of the band recorded a second single for the Pye label in 1967 – Waxie’s Dargle/Old Woman in Cotton ­– as well as their eponymous album for Transatlantic in the following year. At which point, Andy departed for an indefinite busking tour of Eastern Europe. In turn, he was replaced by guitarist Henry McCullough until the new arrival received an offer to join Joe Cocker’s Grease Band (and, in doing so, apparently became the only Irishman to play the Woodstock festival). Moynihan and Woods soldiered on for a while with the singer Al O’Donnell, but ultimately opted to continue as a duo. Thus it was in that form that they recorded The Tracks of Sweeney in 1969. By then both men were living in England and were invited, alongside a newly-returned Andy Irvine, by Fairport Convention’s bass player, Ashley Hutchings, to join a new electric folk band. They did rehearse, but Johnny and Andy decided not to participate, leaving Terry and his partner Gay to join the new Steeleye Span and that was the end of Sweeney’s Men. Gay and Terry Woods later went on to work as a duo and with their own The Woods Band before Terry was recruited to The Pogues and Gay rejoined Steeleye Span. Andy, of course, was in every line-up of Planxty, had a spell with De Dannan, worked as a duo with Paul Brady, spent many years in Patrick Street, recorded with Davy Spillane and nowadays is part of Mozaik. Johnny Moynihan replaced Dónal Lunny in Planxty and also joined De Dannan for a brief time before going on to form The Fleadh Cowboys in the 1980s. He’s still working, though most often as a soloist. Irvine, Moynihan and Woods did reform as Sweeney’s Men for a couple of Irish festivals in 1982. So, that’s a snapshot of their history. What about the music? Well, it all seems curiously dated almost forty years later in ways that, for instance, the first albums by Planxty and The Bothy Band simply do not. In part the reason lies in the fact that Sweeney’s Men was very much a vocal group. Andy Irvine’s young voice had a definite rural burr. On the debut album Terry Woods opted for a distinct mid-Atlantic style, though, by the time of The Tracks of Sweeney, he was singing more like a member of a psychedelic band. Johnny Moynihan’s distinctive nasal tone has remained more of a constant. The second reason relates to the choice of material. The first album mixed traditional ballads such as Willy O’ Winsbury and Reynard the Fox with more recently composed material, such as Dominic Behan’s Dicey Riley and Pecker Dunne’s Sullivan’s John with the frankly hackneyed Tom Dooley and a few instrumental tracks. The Tracks of Sweeney is dominated very much by Woods (who composed four of the eleven tracks and co-wrote another). These include the frankly bizarre Brain Jam (which would not have sounded out of place on an early Pink Floyd album), while another track, Pretty Polly, continued his fascination with American roots music. Moynihan’s leads include the very wistful Standing on the Shore and A Mistake No Doubt (which might have come straight from an Incredible String Band album). Finally, there’s the matter of the arrangements. Sweeney’s Men evolved from the fringes of the ballad group movement and it shows in the tune settings where the lack of a dominant lead instrument waters down the overall effect. Even the acclaimed bouzouki is not that prominent in the mix and virtually non-existent by the time of the second album where the shortcomings of operating as a duo are exhibited on the somewhat insipid instrumental, The Pipe on the Hob. Indeed, the arrangement of the closing song Hall of Mirrors is excruciating. However, that is not to say that there is no merit in these recordings, but, clearly, The Tracks of Sweeney was a failed experiment. Unsurprisingly, it took some months to record and the increasingly fractious relationship between Moynihan and Woods was never likely to produce a coherent album. As Colin Harper recounts in this anthology’s liner notes, Gay Woods characterised them as “two eccentrics who happened to be, unfortunately, eccentric in different ways”. In contrast, the eponymous album definitely does have its moments, but most of these are linked to the presence of Andy Irvine (especially Willy O’ Winsbury) and the fact that the band distinctly gelled as a trio. Both albums have been reissued on several occasions. The last time was in 1996 when Castle Communications managed to squeeze both onto one CD and include Old Woman in Cotton as well. Castle had acquired the rights to Transatlantic’s back catalogue and was subsequently taken over by the Sanctuary Records Group. Its Castle Music label has been busily reissuing other Transatlantic releases, such as three of The Dubliners’ albums, each of which included rare material. 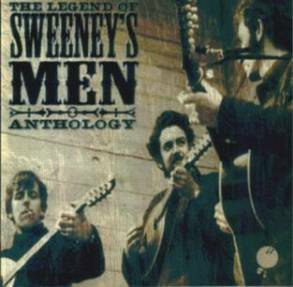 Similar rarities have been included on The Legend of Sweeney’s Men although whether there’s any value in hearing old singles by The Capitol Showband on which Sweeney’s Men provided some of the backing is highly debatable (especially as these include the Country and Western song The Streets of Baltimore and an awful version of the Tom Paxton song Bottle of Wine). There are five such tracks on the first CD which, however, does open with all four songs from the two early Sweeney’s Men singles. The package’s compiler has even more problems with the second disc since The Tracks of Sweeney was a relatively short LP, lasting a mere thirty-three minutes. So CD two opens with Autumn Gold which hails from the album Andy Irvine recorded with Paul Brady and released in 1976. The reason for its presence here is that it was written during Andy’s Balkan travels and was also aired during the abortive Hutchings rehearsals. Then follows the tracks of The Tracks ensued by seven additional recordings. Two of these (versions of Willy O’ Winsbury and Sullivan’s John) come from albums recorded by Johnny Moynihan’s erstwhile partner, the Notts-born folk singer, Anne Briggs (who, coincidentally, was raised just around the corner from the home of this reviewer’s aunt and uncle). Two more derive from the Woods’ sojourn with Steeleye Span though here the credibility’s elastic begins to stretch towards breaking point. The first of these, The Dark-Eyed Sailor, is included because Terry Woods learnt it from Al O’Donnell (who spent such a short time as a member of Sweeney’s Men) and the second, Lowlands of Holland, because the tune came from Andy Irvine. Then follows a Woods Band rendition of Dreams for Me (which has already appeared as the second track on this disc) while the second CD ends with two tracks from Andy Irvine’s 1996 solo album Rain on the Roof. The first, Baneasa’s Green Glade recalls Andy’s Balkan trip while the other, My Heart’s Tonight in Ireland, name checks Sweeney. Whoops, but the elastic’s just snapped! Might other material have been included? Well, Colin Harper reminds us that there are ‘no surviving radio or live recordings of Sweeney’s Men’, though strangely his notes refer to ‘an atmospheric amateur recording of a gloriously shambolic warm-up show in a pub in Crusheen, County Clare’ prior to one of the band’s 1982 reunion gig and also a ‘somewhat shambolic’ (Colin obviously likes the word) live RTÉ radio session by the McCullough/Moynihan/Woods line-up in 1986. Does either exist? If so, that material would have been far more interesting. If not, is Colin relying on someone else’s memory of their ‘shambolic’ nature? Instead he points the interested listener towards impossibly rare albums by Dr Strangely Strange on which there’s a Sweeney’s homage and both Moynihan and Irvine appear and an even rarer single by the band Skid Row on which Johnny “apparently” plays tin whistle! His liner notes, however, do make for an enthralling and generally informative read and offer a taster for his forthcoming book Irish Folk, Trad and Blues, to be published in October, 2004. 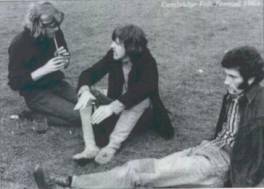 Nevertheless, they clearly rely heavily upon an interview with Andy Irvine and, to a lesser extent, one with Henry McCullough. The influence of either Terry Woods or Johnny Moynihan on Harper’s material is difficult to detect. Of course, Johnny is notoriously difficult to track down and I cannot recall ever seeing a published interview with Terry Woods, but their absence from Colin’s material is very obvious. A further problem is that there are errors in the text which, hopefully, will be not be duplicated in the forthcoming book. For instance, Sweeney’s Men could not possibly have taken their name from a book by Flann O’Brien since the book in which the character of Sweeny [sic] appears is actually called At Swim-Two-Birds. There was no UK record label called ‘Rockborough’ (it was Rockburgh) and Fairport Convention certainly did not record an album called ‘Leige and Leif’. Still, the archive photos more than compensate for those errors and, ultimately, this is a better-presented package than the one previously issued by Castle Communications. Click here for more information about Sanctuary Records.